The European Union (EU) has introduced retaliatory tariffs on US goods as a top official launched a fresh attack on President Donald Trump’s trade policy. The duties on €2.8bn (£2.4bn) worth of US goods came into force on Friday. Tariffs have been imposed on products such as bourbon whiskey, motorcycles and orange juice. 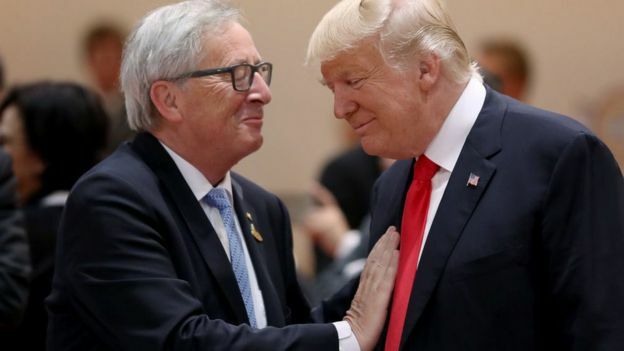 European Commission president Jean-Claude Juncker said duties imposed by the US on the EU go against “all logic and history”. India, meanwhile, has said it will raise taxes on 29 products imported from the US – including some agricultural goods, steel and iron products – in retaliation for the wide-ranging US tariffs. The new duties will come into effect from 4 August and will affect US almonds, walnuts and chick peas, among other products. India is a top buyer of US almond exports and so the move is expected to hurt farmers in America. The Trump administration announced in March that it would introduce tariffs of 25% on steel and 10% on aluminium imported into the US. After being deferred, the duties on steel and aluminium went ahead on 1 June and affect the EU, Canada, Mexico and other close US allies, including India. Addressing the Irish parliament in Dublin, he added that “we will do what we have to do to rebalance and safeguard” the EU. 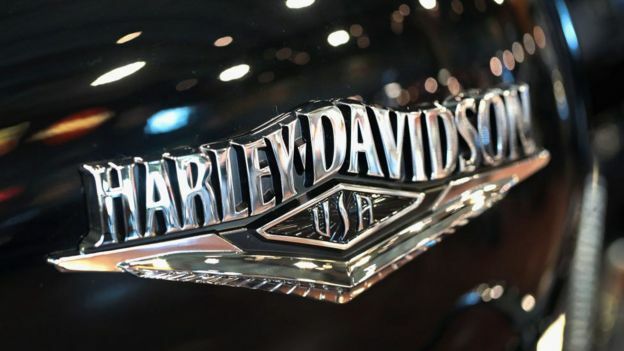 The majority of US goods targeted by the EU, such as tobacco, Harley Davidson motorcycles, cranberries and peanut butter, will now carry a tariff of 25%. However, the EU has introduced a 50% duty on goods such as footwear, some types of clothing and washing machines. The new duties have been imposed as tensions over trade continued to grow between the US and China. Earlier this week, Mr Trump threatened to impose 10% duties on an additional $200bn (£150bn) worth of Chinese goods which he said would come into force if China “refuses to change its practices”. However, China accused the US of an act of “extreme pressure and blackmail” and said it would respond with “strong countermeasures”. Why is the US imposing tariffs? President Trump believes that if you have a trade deficit – if you import more than you export – you are losing out. He is especially irked by the hefty deficits in US trade with China and Mexico, but has indicated that he will not let any country “take advantage of us on trade anymore”. The US trade deficit has increased in recent years, running at around $50bn (£38bn). However, this could be the result of a stronger economy, with US consumers buying more goods from overseas. The new tariffs are meant to correct this imbalance. There were confrontational scenes and words after the recent G7 summit in Quebec, at which the other major world economies challenged Mr Trump’s tariffs and trade policies. A photo from the summit went viral, showing the leaders of the other member nations standing over the president, sitting with his arms crossed. The US tariffs, and retaliatory measures from other states, have caused fears of a trade war, weighing on global stocks. In the past however, President Trump has said trade wars are good and “easy to win”, despite a jittery response from the markets.